Leave nothing to chance to overcome their relentless approach in Fort Defense, a uniquely adrenalizing tower defense game that requires keen planning and implementation of your best defense strategy. Mine gold, collect barrels and crystals, build towers, and upgrade spells. Fortify your durability, increase your booty, and implement weapons with strategic intent against your swashbuckling attackers. Build up your resources early, so when the challenge gets ever harder you have the gold to make necessary upgrades. Don't squander what you have today at the cost of tomorrow. Repel and squash the assaults of the uncompromising pirates when you download the free full version of Fort Defense! 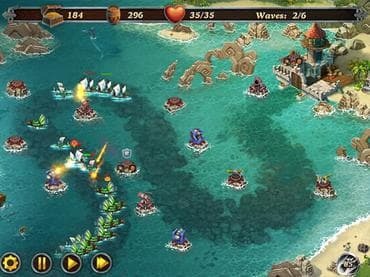 Free Game features: - Engage in immersive battles at land and sea; - Employ a unique and extensive system of magic; - Make strategically considered upgrades to equipment, towers, and spells; - Master the attacks in the Caribbean Sea to unlock new challenges in the Arctic Ocean. If you have questions about Fort Defense game, please contact us using this form.